Offering what has been described as the best Aberdeen Angus steaks on London's South Bank, Gillray’s is a traditional restaurant situated on the banks of the River Thames with spectacular views of the London Eye. Serving authentic British cuisine using ingredients locally sourced from English farms no more than 150 miles away from the restaurant, Gillray's strives to use the best from the land and sea. With this in mind we decided to give their set menu a try! 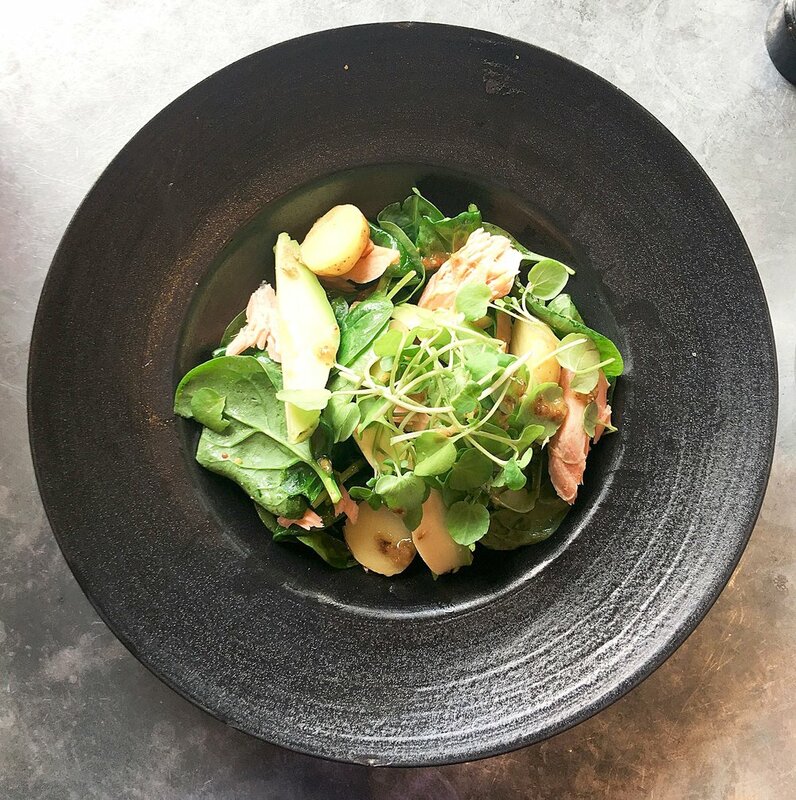 From the three course set menu, I tried a delicious fresh hot smoked salmon salad with baby potatoes, spinach, avocado and mustard. We also tried crispy Clarent Court burford brown eggs, with pancetta crisp and asparagus. Although eggs are not usually served as a starter for dinner, this dish balanced the flavours well enough for it not to seem too irregular. We had to wait a while for our main course, which was a bit of a struggle in the heat wave we were experiencing! However when my Gillray’s pork pie with quails eggs, mature cheddar mash and warm piccalilli arrived it was delightful! The presentation as well as the portions of all the elements were matched well and created an enjoyable and delicate dish, which you wouldn’t expect from a pie main course! We also tried the rib-eye, something with Gillray’s is famed for, and ordered fries, tenderstem broccoli and Lyburn dauphinoise potato on the side. Our desserts were beautifully presented and both the chocolate and hazelnut bar and ‘adult’ alcoholic ice cream were delectable. I particularly enjoyed the combination of spiced rum and Bathtub gin ice cream! The set menu at Gillray's can be enjoyed for less than £25, which is great value compared to the a la carte menu. Gillray’s is a grand venue with beautiful views across London’s Southbank. When we dined there the staff were attentive but busy, meaning the food was delayed. However the food, drinks and venue were impressive and I would give Gillray’s another chance by dining there again. Special thanks to Gillray's for their hospitality!